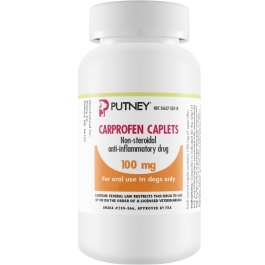 Carprofen Caplets for Dogs are used for the relief of pain and inflammation associated with osteoarthritis and for the control of postoperative pain associated with soft tissue and orthopedic surgeries in dogs. The recommended dosage of Caplets is 2 mg/lb. daily, given in 1 dose or divided between 2 doses daily. Carprofen is the generic alternative to Rimadyl, Novox, and Vetprofen.